MICHELIN trial tyres that bring together softness, grip and durability. A safe bet for professionals and hobbyists alike. Why choose MICHELIN Trial tyres? Thanks to their lightweight design, MICHELIN Trial Light Competition1 tyres make it easier for you to get on your way. Your bike will literally fly over any obstacles. You'll ride more efficiently and your bike will perform better than ever. 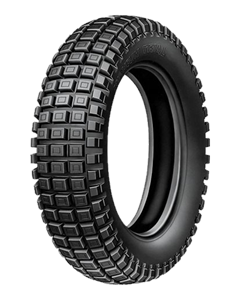 Available as a radial version: MICHELIN Trial X-Light Competition. Trial Light Competition1 tyres feature a carcass suited to trial racing. They adapt to absorb the impact of any obstacles they encounter. You can weave in and out of any rocks thanks to their unique performance characteristics and their exclusive design. 2014 and 2015 Trial Indoor World Champion and 2014 Outdoor World Champion for the 9th consecutive year with Toni Bou.